Welcome to the Virtual Vegan Potluck! I hope you enjoyed the yummy side presented by Girl Eats Greens! To me, even before I was vegetarian or vegan, Thanksgiving was NEVER about the turkey. It was ALWAYS about the side dishes, and especially the casseroles! You know the ubiquitious holiday casserole I’m talking about. Canned green beans, Campbell’s “Great for Cooking” Condensed Cream of Mushroom soup, fried onions. To be sure, some people in the South did “do” green bean casserole, but some people also wore white shoes after Labor Day. Or drank their sherry from wine glasses – and probably sweet sherry at that. My family was not “those” people. We packed away our white shoes and jeans after Labor Day and didn’t break them out again until Memorial Day. We drank our sherry out of tiny sherry glasses with cut-glass patterns with names like “Cord and Tassel” and “Coachman’s Cape.” And yes, we drank it dry or very dry, not sweet. And what we “did” at holidays was Asparagus Casserole. 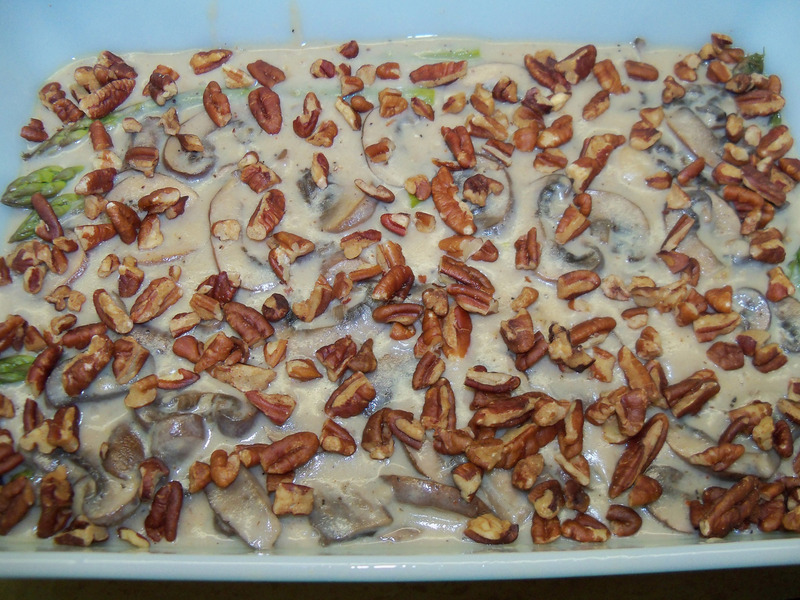 Asparagus Casserole – canned asparagus, Campbell’s “Great for Cooking” Condensed Cream of Mushroom soup, cheddar cheese, chopped pecans, and saltine crackers on top. I know, I know. It may sound similar to Green Bean Casserole to the uninitiated but on such small distinctions stature in Southern society rests. It’s not only your accent but what you bring to a potluck that can reveal your “white trashy” background faster than a trailer park accent or a NASCAR bumper sticker on the back of your pickup. “Bless her heart, she’s from … up yonder … she can’t be expected to know any better,” the aunts would whisper, pointedly ignoring the casserole. As I grew older, I learned that not only was Green Bean Casserole not “done,” you didn’t mess with the Asparagus Casserole recipe, either. In my twenties I became vegetarian and experienced my first real interest in cooking and healthy eating. I decided it was time to gussy up the Asparagus Casserole. The canned asparagus had to go – I would use fresh. I would also add a small can of mushrooms to the soup so there’d be real mushroom slices, not just small flecks of unidentifiable gray matter. Leave the cheese. Keep the pecans. Add some sherry. Add some more sherry. And – ta da! use bread crumbs instead of crumble saltines on top. 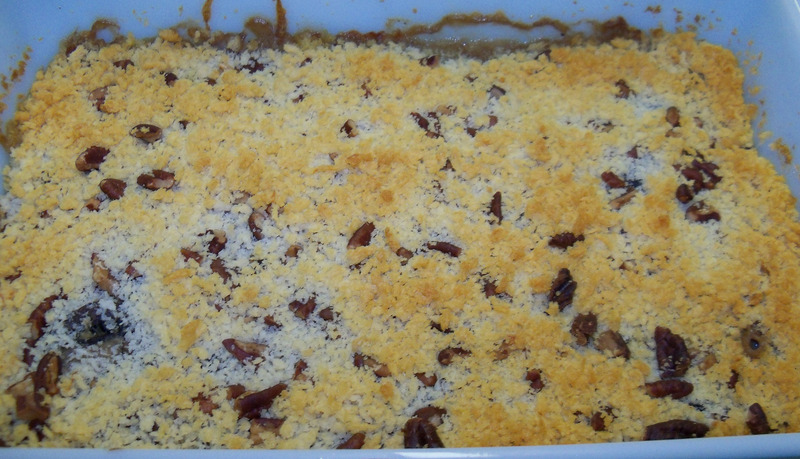 I proudly … and naively … brought this revamped casserole to our holiday gathering. “It’s a bit … highfalutin, isn’t it?” one of my aunts remarked to another. “The bread crumbs seem a bit uppity,” another observed. Fast forward and now I’m vegan! It took me awhile to get around to veganizing this family “classic” – partly because I don’t often think of it except at Thanksgiving, Christmas, and Easter. My first thought was to substitute a vegan Cream of Mushroom soup for the Campbell’s. The only vegan mushroom soup I could find (that I liked) was Imagine’s Creamy Portobello Mushroom Soup. Unfortunately, although it is tasty, it tastes nothing at all like Campbell’s! 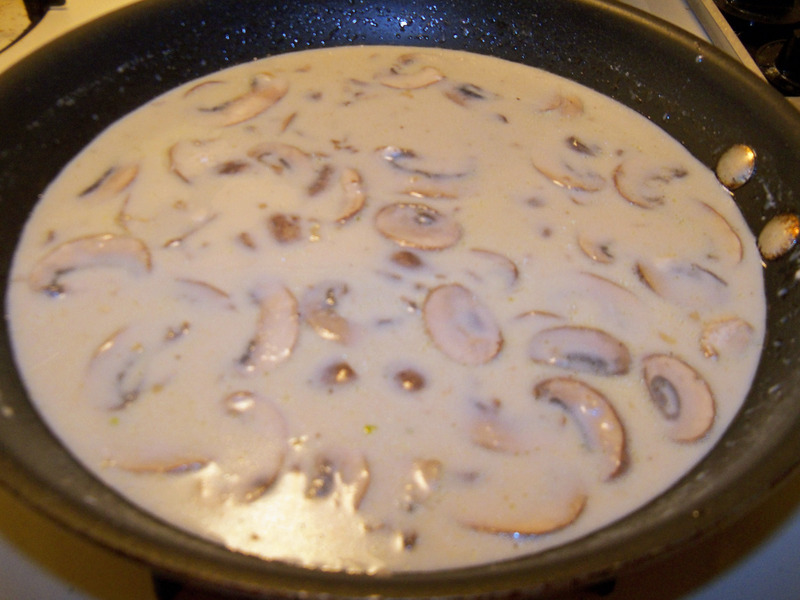 But every Southern girl knows how to whip up a white gravy with butter, milk, flour, and pepper, and from there it was an easy step to add mushrooms, garlic, and sherry. The biggest issue was the cheese. I don’t like Daiya, and nutritional yeast tasted too … well, nutritionally yeasty. Too noochy, if you will. Finally I decided to eliminate the cheese altogether (oh my stars!) 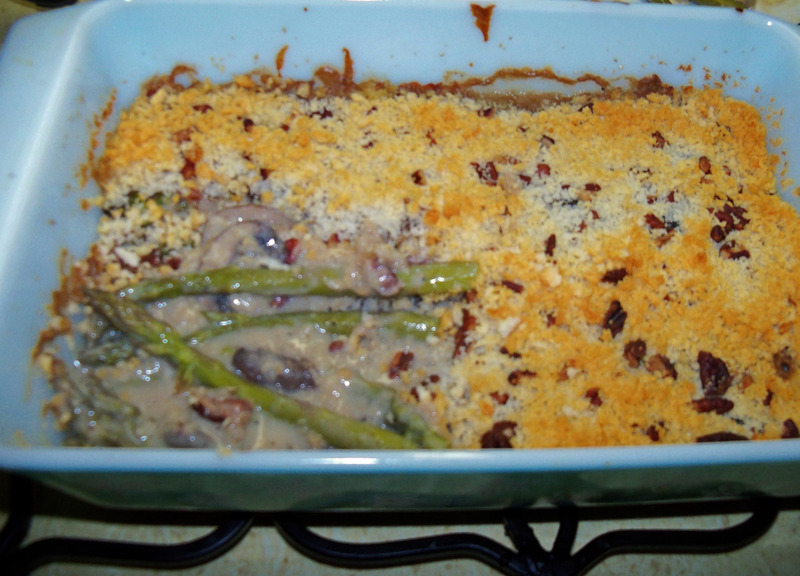 I was pleased with the result – without the “cheesiness” the casserole was much less rich and allowed the flavors of the asparagus and mushrooms to really shine. 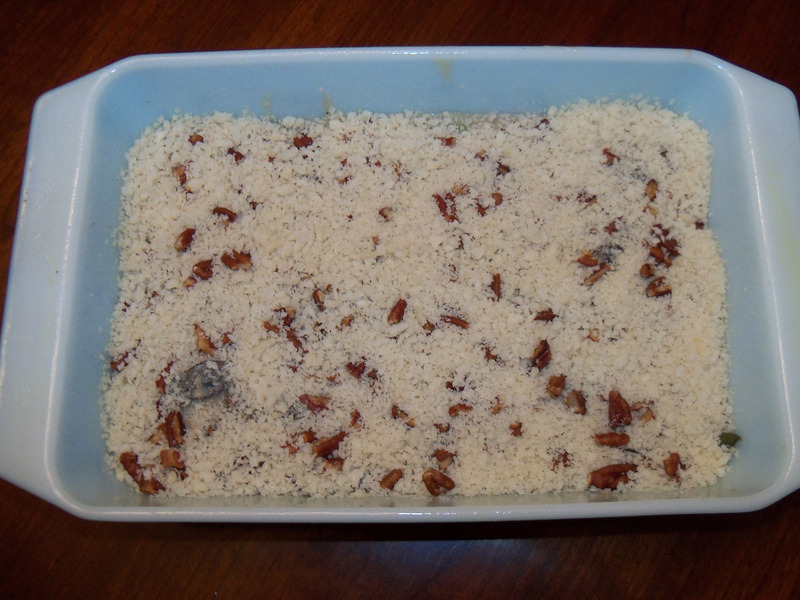 Don’t get me wrong … this casserole is still rich. Really rich. In many ways this casserole is like the perfect man … extremely rich, very satisfying, and only comes around three times a year. 1 Box Fresh Button or Crimini Mushrooms, approx. 8 oz. Preheat oven to 350 and spray a casserole pan with a little Pam or some olive oil from a spritzer. Snap the woody ends off the asparagus and discard. Rinse the asparagus tops and then steam for approx. 8 – 10 minutes – until “tender-crisp,” as they say. Then arrange in casserole dish. 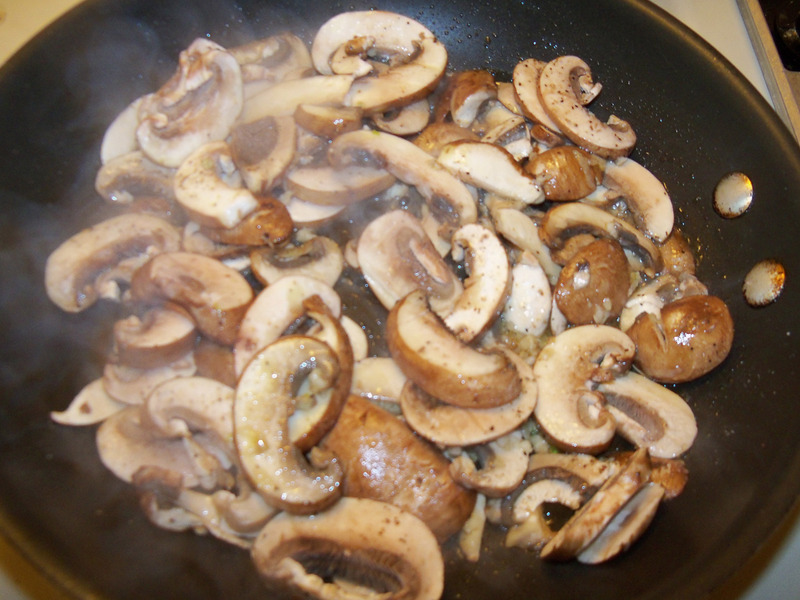 While asparagus is steaming, slice the mushrooms and mince or press the garlic. Once it starts to thicken, add the chopped pecans. Pour over the asparagus. Sprinkle crushed plain saltines over the top, or bread crumbs. Bake in oven at 350 for 30 minutes, or until bubbly and saltines/bread crumbs are brown. Now, it’s time to go to Mojo Central for another yummy side! 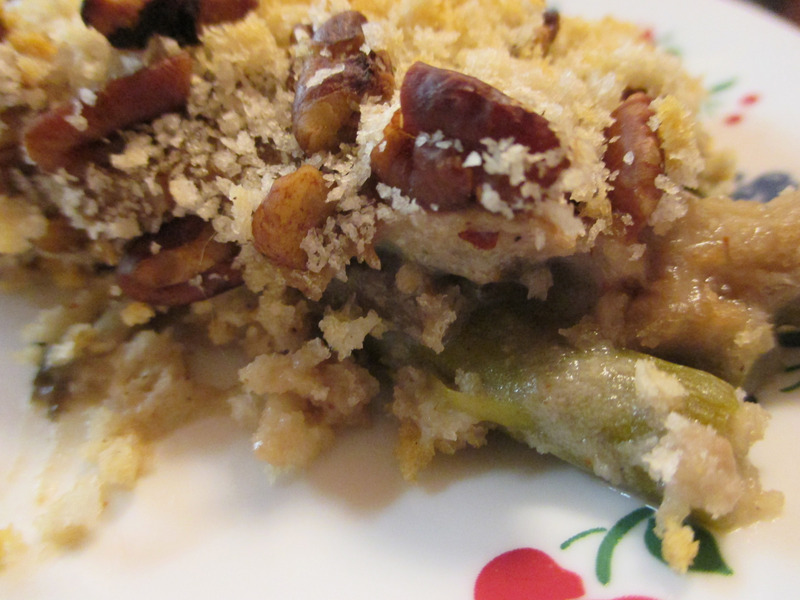 Love this recipe.. I’ve stayed away from green bean casseroles just because they are so rich and fattening. Really enjoyed reading this post.. Those comments from aunts.. So typical of any family gathering 🙂 enjoy the potluck! Thanks! Glad you enjoyed the post! I actually thought about you when I was writing it! Ha, I wasn’t referring to the desi aunties! I just meant you’d made comments in the past about liking it when I included stories with my recipes! Ha ha! I loved your story. I definitely can relate to all those phrases, such as “bless her heart”, having grown up in the south. We were a green bean casserole family over here. But I’m totally down with your highfalutin’ asparagus version. It looks so creamy and delicious! Love the look of those mushrooms! Your back and forward links are the wrong way round making a loop in the chain! Mojo central should be the go forward link! Thanks for catching that, Poppy! Just changed it but I don’t think it made a difference as of yet … my link is wrong as I saved the link a week ago, but when I published WordPress changed the link address! 😦 Annie’s going to update the link soon … thanks again for being eagle eyed! This looks great! Mushrooms are my favourite meat replacement. PS Link seems to be sorted out, I just clicked through now. Thank you for the lesson in Southern social norms ;-)! 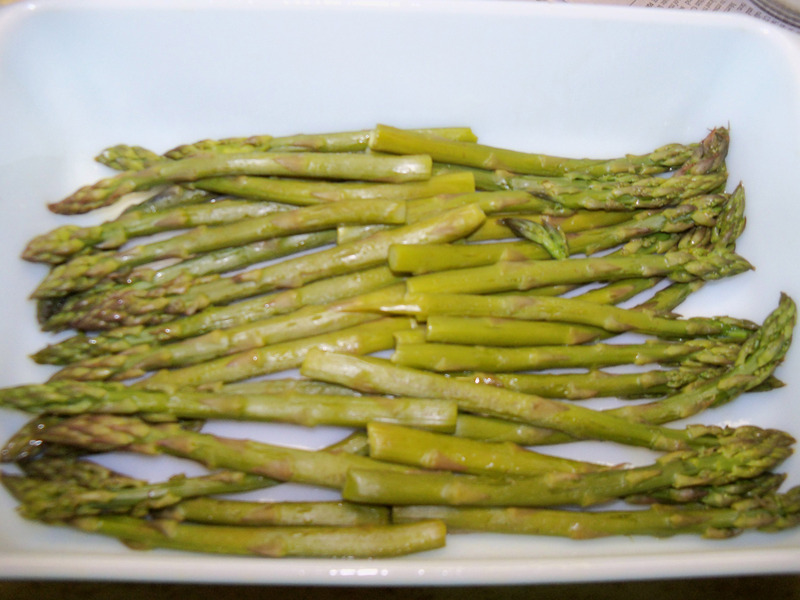 Love the creaminess of this dish and in my opinion, asparagus beats green beans by a mile! I prefer asparagus in general, too. But I’m thinking of trying it with fresh green beans one day, just for the heck of it! Wow, nice! I’ve never actually had a Thanksgiving-y green bean casserole (I guess, like yours, my family was also not *those* people…), but anyway I’m SURE it would be better like what you’ve done—made from scratch and with asparagus! Thanks! I admit I do miss that awful Campbell’s cream soup but fresh asparagus really does make a world of difference! Thanks! I’d invite you over, but my partner already ate the leftovers! I would have to ditch the sherry or I would be under the table. Still great bet. I know it’s a lot of sherry, but around “these here parts” we used sherry a lot to cut the richness of she-crab soup, corn chowder, and mushroom soup. I would think you could substitute a tablespoon of lemon juice for the sherry and achieve a similar effect. You had me at asparagus… and it kept getting better as I read! I never grew up with green bean casserole OR asparagus casserole, apparently I grew up in the wrong area because that looks fantastic! What an awesome story! As a Russian transplant to South Alabama, I’ve rolled my eyes quite a few times at some of the Southern antics! Love your recipe! Thank you! From Russia to South Alabama … wow, that must have been a culture shock! Just chuckle at the “antics” – that’s a great word for it! haha! I had a good chuckle reading your story of the original green bean casserole. I don’t think I’ve ever had one. I love your “uppity” version with asparagus and mushrooms. Yummy! I’m really enjoying this potluck – so many new and delicious dishes to try! Glad you liked it! The potluck is super-amazing this year, isn’t it? Oh, thank you! I am so flattered!